Airport design by NAPS (Freddy de Pues) New in version 8.0 is OLS (meatball) with aircraft carrier markings by KAZ Nakata. 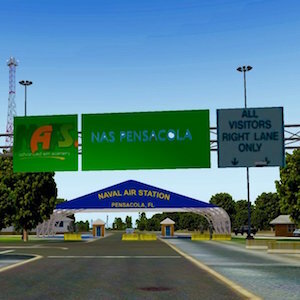 Naval Air Station Pensacola or NAS Pensacola (IATA: NPA, ICAO: KNPA, FAA LID: NPA) (formerly NAS/KNAS until changed circa 1970 to allow Nassau International Airport, now Lynden Pindling International Airport, to have IATA code NAS), “The Cradle of Naval Aviation”, is a United States Navy base located next to Warrington, Florida, a community southwest of the Pensacola city limits. This airport from NAPS is a full HD customized scenery (SketchUp), extremely detailed, animations, including some of Marc Leydecker’s & Hans Gindra’s © assets. Historic landmarks. Tweaked orthos, courtesy USGS, for better immersion in XP environment. Feathered contours. Tropical waters. Military objects by David Austin. Special thanks to Fabrice Kauffman for his exclusive © F-35B static.